Merlin Flight School's lesson programs are custom tailored to the individual pilot. We offer both beginning and advanced lesson packages as well as tandem instruction and advanced mountain trips and tours. We specialize in training small numbers of people well. 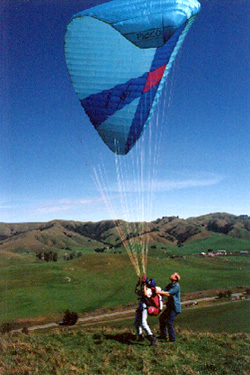 The principal instructor and owner, Wally Anderson, has over 30 years' experience in safely teaching foot launch flight. Lessons are by reservation only and payment for the lesson is required in order to confirm the reservation. In order to insure the best experience and the most well-rounded complete training possible, our training takes place at various sites around the Bay Area. Students call in on the morning of their lesson to confirm weather, location, and the time to meet. Meeting time varies somewhat depending on wind, location, and time of year, and is typically between 9:00 a.m. and 10:00 a.m.
All our instructors are USHGA certified and use the USHGA approved "building block" teaching method. Recommended as a first step or for anyone wanting to just experience the sensation of personal flight. Consists of approximately 4-6 hours of instruction, and equipment rental. On this first day you will learn to unpack your glider, preflight it and, after a demonstration by your instructor, you will learn to inflate the glider, clear it, accelerate for take off, steer, and flair for landing--all on a shallow slope. Once you are proficient at this drill we move to a slightly steeper slope for your first flights. As the day continues we move progressively up the slope at a rate depending on individual ability and comfort. By the end of Day 1, a typical student has had several successful launches, flights and landings with minor changes in speed and heading. An entry level course for those people serious about the sport and who wish to become competent enough to start flying on their own. Consists of instruction, equipment rental, an 8-10 hour ground school, text book, log book, USHGA skills sign off book, ground school syllabus and other related materials. This course is designed to teach you the basic skills and knowledge necessary to qualify for the USHGA Novice (P-2)* rating. Also included are an introduction to coastal ridge soaring and a mountain trip to introduce you to thermal flying. We progress from the skills learned on the first day into steeper turns, wind and weather analysis, flight planning and execution, kiting, reverse launches, cross wind launches, weight shift turns, big-ears, speed stirrup usage, etc. Because we feel that it is important to graduate well-trained, fully-qualified pilots, the course is open-ended and will include enough days for the student to fully qualify for a Novice (P-2) rating. Purchase of this package qualifies you for a substantial discount towards the purchase of a new equipment package. This discount will vary somewhat depending on the type and brand of equipment chosen, but generally runs from $750-$900. Five additional days of training. May be used for trips and special skills clinics as well as for polishing your general skills. You must have purchased your own equipment in order to qualify for this course. One full day's lesson and equipment rental. Lesson packages must be used within one year of purchase date; after that they expire. Lessons are by reservation only. Payment must be received to confirm a reservation. Lessons may be cancelled with no penalty with 24 or more hours' notice. No-Shows will be charged for the full lesson day. All students will be required to sign releases of liability prior to taking the course. Partial lessons due to wind or weather will be prorated accordingly. Participants must be in reasonable physical condition and sign an affidavit attesting to the fact. There are absolutely no smoking or dogs allowed on the training hill. Students should wear long pants, light hiking boots or tennis shoes and bring a light lunch, water and sunscreen. © 1999- Merlin Flight School. All rights reserved. Site design by CDClark Web Development.